Fotomoto | How do I install Fotomoto on iWeb? How do I install Fotomoto on iWeb? We've decided to drop support for integrating Fotomoto with iWeb sites. Unfortunately, iWeb outputs HTML for images in a way that prevents Fotomoto from working as it was designed to, and though we were able to add Buy Buttons to an iWeb page, the end result made for what we consider to be an unacceptable end-user experience. If you would like to try using Fotomoto with iWeb, the installation instructions are below, but note that we do not provide support and recommend that you instead use one of the applications or services listed on our How page. We apologize for the inconvenience...we tried to make Fotomoto work nicely with iWeb, but it just wasn't working out. These instructions are for the iLife '11 version of iWeb only. It's also important to note that because of the way iWeb generates HTML, Fotomoto will work a little differently than normal - the Buy Buttons will appear in a single bar at the top of the page, not under each image as usually. On the Settings page of the Fotomoto Dashboard, change your Publishing platform to iWeb, then click the Save button. 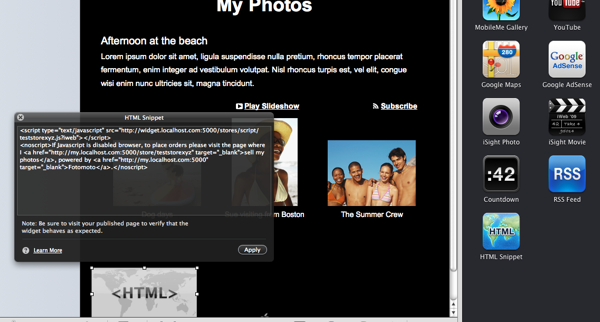 Click the Fotomoto Script link, and copy the script from the pop-up window. In iWeb, add a new HTML Snipped to your document. Now just paste your Fotomoto Script in to the widget and publish the changes. You should now see a single row of the Fotomoto Buy Buttons on your photo pages created with iWeb. Note that when using Fotomoto with iWeb, your customers will need to click one of the Buy links and select which photo they're trying to purchase, where normally there would be a set of Buy Buttons under each picture. If you have trouble installing Fotomoto on your site, take a look at the Troubleshooting articles in our Support Center for help.